If you have several pieces of jewelry and need a professional appraisal to determine the value for insurance or tax purposes or you’re interested in selling your jewelry, graduate gemologist Rebekah Anderson can provide you with a detailed, same day report. It’s not necessary to leave jewelry for days or weeks at a time. Earth Pebble’s clients can make an appointment and be present while their appraisal is preformed. Rebekah will appraise your jewelry during your appointment in her office centrally located between Cameron Village and Five Points at 2515 Fairview Road, Suite 204, Raleigh, NC, 27608 (corner of Oberlin and Fairview). 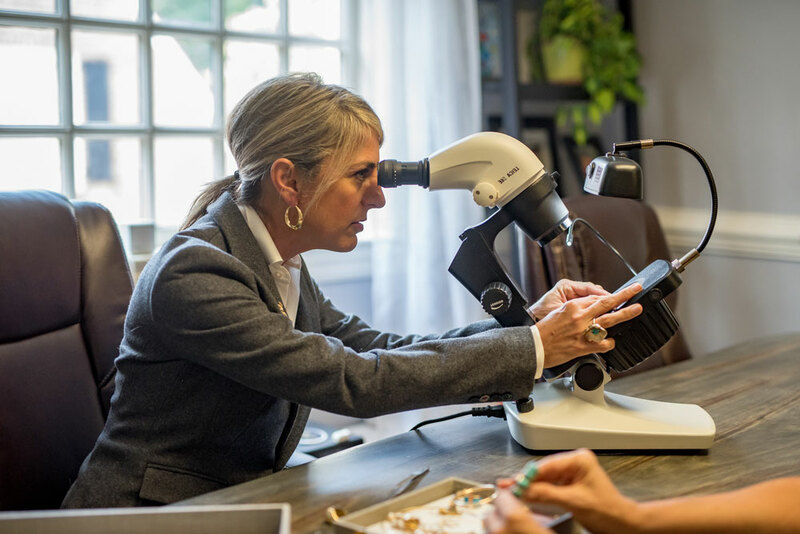 Rebekah adheres to the professional guidelines established by the National Association of Jewelry Appraisers (NAJA and embraces the code of integrity, responsibility and skill required to maintain these standards. Strict adherence to the Uniform Standards of Professional Appraisal Practice (USPAP) makes her documentation of your jewelry legally binding.